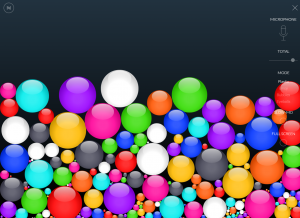 Here is a nice app that will help us to monitor the class noise level: Bouncy Balls. The tool activates your computer’s microphone and detects the noise level in the classroom. If the class is too noisy, you will see that the balls will be flying and jumping in the screen, if the noise is fine in the classroom, the balls will not go that wild and they will remain still. This is just a new way for classroom management. This tool can be used as the students are working in groups or doing pair work or anytime you like. It’s simple and fun and you only need a microphone.